We spent our days looking for and finding animals in their homes. We had extraordinary good fortune in seeing all that we did. The slide show images are winnowed down from 8,000 shots. I cannot begin to tell you the excitement of each and every encounter. It was as though I had gone out in the mountains to photograph the elusive pikas and much to my surprise hundreds of pikas lined up on the rocks to let me take their pictures. Beyond my wildest dreams! Ted plans a similar trip in 2013, if not this year, and I am already packing my bags. The proposed itinerary is on imageartisan.com. Save your pennies and consider signing up. If you would prefer to enjoy the photos and stay at home, that's great too. Let me tell you about the places I went and give you some links to explore. We landed in Nairobi. The first day was packed with visits to the David Sheldrick Wildlife Trust that rescues and rehabilitates orphaned elephants and rhinos, the African Fund for Endangered Wildlife Nature Center where some Rothschild Giraffes with characteristic "white knee socks" live, and the Karen Blixen House of "Out of Africa" fame. I fell in love with the elephants at the Sheldrick orphanage. For one hour each day the elephants are brought in from the fields and woods to see the visitors. They drink their milk, romp around and spray themselves with the dust that is so red there. In December I "adopted" little Kithaka (at left) who was separated from his mother when he was just a few days old. I follow his progress online and am happy to report his first 4 teeth are in. 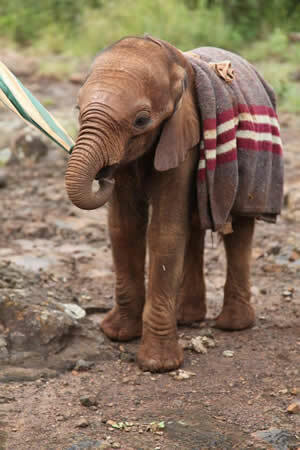 There are lots of young elephants that could use our help. They are taken care of around the clock by their faithful keepers and in time are reintroduced into the wild at Tsavo National Park. You can see videos of the rescue efforts, see photos of all the elephants, and even adopt an elephant or two on line (sheldrickwildlifetrust.org). We headed southwest from Nairobi to Tsavo West National Park where the earth is a marvelous red and the animals are abundant. We stayed at the Kilaguni Serena Safari Lodge (Kilaguni Lodge) which was built beside a watering hole that is frequented night and day by elephants, giraffes, marabou storks, zebras, waterbucks, guineafowls, elands, gazelles and others. One group after another sauntered in for a good drink and then headed out into the vast land. Further out in the park there were more giraffe, zebras, a sleeping leopard and more elephants. Did I mention the food? Delicious. The dining room? Open and looking over the watering hole. And the swimming pool? Delightful for a quick dip after lunch before heading out again for the animals. Then it was on to Amboseli, the place where elephant families have been studied for years by Cynthia Moss (elephanttrust.org). Her studies have documented much of what we know about the family structure and lifestyle of elephants. We were fortunate to see loads of elephants enjoying the swampy areas there. It was after I returned home that I found out that we saw so many elephants because they were pregnant and staying close to home. Twenty two months before, a drought had ended and most of the female elephants decided it was OK to get pregnant. Since November, 2011 over 100 babies have arrived and there are more on the way in early 2012. There are lots of photos of these seemingly tiny elephants on the elephant trust website. Heading north past Nairobi we stopped at the William Holden Animal Orphanage (Holden Orphanage) to see cheetahs, birds, bongos, hippos, and monkeys. I was especially happy to see the bongos (at left) who live there. They are beautifully colored endangered creatures that the orphanage is attempting to revitalize. We stopped overnight at the mountain lodge at Mt. Kenya, but the watering hole didn't have visitors that night. The only excitement was being pestered by Sykes monkeys fiddling around with our windows trying to get in. Farther northThe Elephant Camp at Samburu was superb. Fancy tents on platforms were situated just feet from the Uaso Nyiro River. The food was gourmet. The hostess in the dining tent was an orphaned Oryx named Mary. Elephants, baboons, crocodiles were nearby. Further into the reserve were giraffes, zebras, oryx, cheetahs, giraffes, Thomson's gazelles, Grant's gazelles, impala and more. One afternoon the rains came, the river rose alarmingly and the guards spent the night along the river protecting us from the crocodiles. So after all these animals, we still had the Maasai Mara to visit. 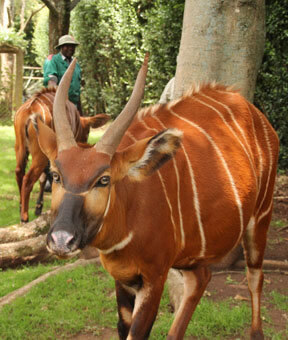 That is home to loads of animals and the place to witness the vast wildebeest migration. There were cheetahs, lions, leopards, zebras by the thousands, wildebeest by the thousands, elephants, giraffe, gazelles, hippos. There were also rhinos, but they hid from us. We watched a herd of wildebeest and their zebra buddies get all stirred up as a leopard stalked through the grass. We watched the wildebeest hesitatingly deciding whether or not to cross the river. They got all steamed up but then decided "No, not today." That suited me just fine because I didn't want to watch some of them perish in the crossing -- nabbed by crocodiles. On our way out of the park there was a bit of a romantic interlude when we came across a courting lion and lioness. And then on to Nairobi and home. Besides the excitement of seeing so many animals up close and personal in their own homes, I found it very interesting to see which ones hang out together. Groups of zebras and wildebeest move together. The elephants with white egrets enjoy the swamp with the cape buffalo. Most of all, I loved the playfulness of the baby elephants. They are silly, happy and adorable. I can not help but mention the welcoming nature and friendliness of the Kenyan people who made our trip such a delight. I would be remiss not to mention the needs of many of the Kenyan people. Two organizations that are helping out are AMAAKE (Artists and Athletes for Malaria Eradication in Kenya) and The Kenya Self-Help Project. The Kenya Self-Help Project (www.kenya-help.org) was founded in 1998 by a core of volunteer leaders in the U.S. and Kenya to mobilize like-minded individuals working to improve educational opportunity and family security for children in Kendu Bay, Kenya. Kathleen Dodge of Burlington, Vermont is the executive director.